Dino found this great high speed video (1000 frames/second) of an Eagle Owl landing on a perch. Here's a short youtube version, but you can see a longer version here. I am entranced by how the feathers move as it lands. When Is a Bug True? On my way back from a walk several days ago, I was greatly distracted by the creek we have to ford on the way to our house. It's still got some water in it, not much but enough to attract all sorts of critters. I watched flame and widow skimmer dragonflies and took a picture of a wildflower I haven't been able to identify yet. Then I saw these bugs - ha! You should have known there would be insects. I sent off a query to the excellent What's That Bug web site and I got a wonderfully detailed reply a few days later. Turns out, they were: "...two immature individuals of a species of Giant Water Bug in the genus Abedus, based on this image of Abedus herberti posted to Bug Guide. 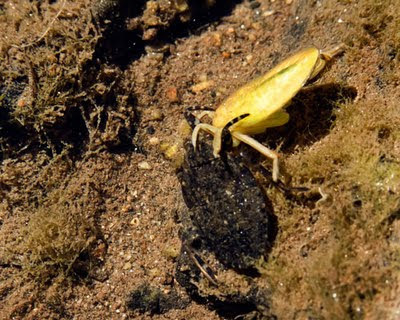 The yellow individual in your photos and the BugGuide image are newly molted nymphs in the teneral stage, meaning that their exoskeleton has not yet hardened and darkened. Insects are especially vulnerable immediately after metamorphosis. We believe the dark individual in your photos, also a nymph, is taking advantage of its weaker coeval by preying upon it. Of course, your photos do not reveal the final outcome, and the teneral individual may have actually been the victor in this food chain drama." Cannibals! The reply went on to describe typical habitat, which was quite accurate for where I found the bugs. And these are what is known as "true" bugs, not that I know why some bugs are true and others are not. The males carry the fertilized eggs on their backs and pictures of this behavior look absolutely disgusting and fascinating at the same time. Yes, these are of the Toe Biter clan. The vegetable garden is starting to die down - the cucumbers are tapering off heavily, and the green beans are done. The delicata squash is still ripening. Tomatoes have been disappointing overall, although we are getting enough to have in our salad every day. I had grand thoughts of having bushels that I would have to make into sauce and so on. This year I also planted some soup beans, i.e. beans intended for drying. It was an interesting experiment and although we haven't eaten any of the beans yet, if they are anything like the beans I've gotten in the past from Rancho Gordo which sells these heirloom varieties, they will be delicious. 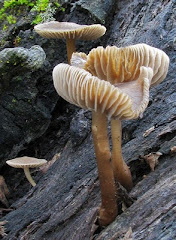 I bought the seeds from Seeds of Change, which offers organic and heirloom seeds of all sorts. I planted one of the raised beds with two varieties: Yellow Indian Woman and Tiger Eye. Dino has been working on the shop building - the electrician finished up last week (well nearly, there are a couple of minor details still outstanding.) Some of the equipment we had in the garage got moved down to the shop, and we've been discussing how to reorganize. 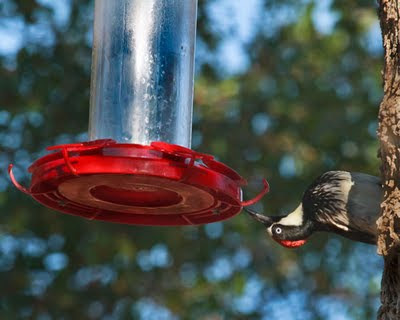 We've been greatly amused by the Acorn Woodpeckers, who seem to have a bit of a sweet tooth, as evidenced by their frequent visits to the hummingbird feeders.